Photos with thanks to Jasmine. 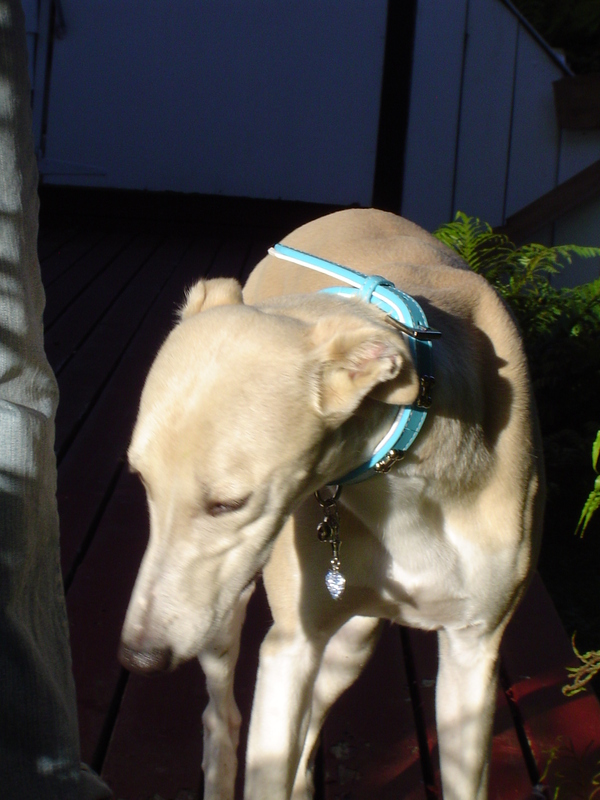 Whippet Breeders & Puppies For Sale If your a Whippet breeder and have Whippet puppies for sale, send us your details for free and we will add to our Whippet Breeders page. Whippet Rescue Center Visit the Whippet rescue centers if your looking to rescue a Whippet, as well as learn more about the breed or just support the rescue centers for there hard work. Origin / History Originally used in the north of England this sighthound was used by miners in rabbit catching competitions, coursing. It is nowadays used for racing in the UK, Europe and the U.S.A as well as being a popular companion pet. Appearance Long head and muzzle, with thin rose ears. Long well muscled neck and fairly long, very deep chested with well sprung ribs and arched loins. Long strong legs and long tail. Colours Any colour or combination of colours, typically black, brindle, red, fawn, cream, blue and white. Height and Weight 44.5 cm to 51 cm in height and 12.5 to 13.5 Kg in weight. Males are generally larger at the top end of the scale. Common Health Problems An alround healthy breed, although may suffer from progressive retinal atrophy. Also being a thin skin bred its skin can be more easily damaged by sharp objects such as brambles. Living Conditions A very adaptable breed who will be happy with life in the country or in a town, including an apartment, so long as he gets plenty of outdoors exercise. Ideally would prefer a house with a garden but if in an apartment make sure gets plenty of visits to the local park. Exercise Requirements Needs a decent daily walk and time off the lead running around the country or local park. Training Requirements They do well at both obedience and agility and will certainly enjoy the mental stimulation of both. Does best with encouraging reward based training methods. Grooming Short dense coat just needs weekly brush with a rubber hound glove. Some owners give the coat a polish with some silk to keep the coat in good condition. CompleteDogsGuide Comment A quiet dog suited to a more gentle owners who enjoy visits to the country or local park to provide plenty of free running time for this sighthound. Owners Comments: Hi, I'm really enjoying looking around your site its fab! I have a 11 month old whippet I'm sending you a photo, I live in New Zealand and the whippets look different here than they do in the UK so whether or not you use it you may decide. 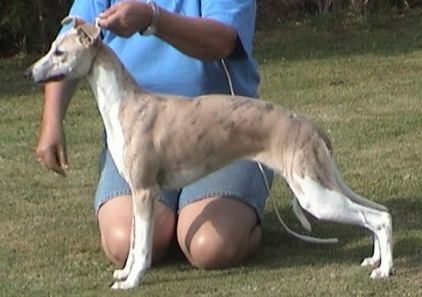 Whippets generally run fast but in short spurts so are not endurance dogs. As you mentioned are calm and gentle natured but make great pets for energetic people rather than the elderly but they do fit in anywhere, they are very intelligent and pick things up really quick e.g.. My dog Rufus learn to sit in half an hour! The photos are of Rufus I apologise you cant see his body, and his half sister Tinsie. Tinsie is a puppy I dont know how old and Rufus is 9 months in that photo. More Whippet Information: Check out our Whippet Clubs and links to more informative websites dedicated to the breed.